Once across the Black Sea, the lunar shadow's eastward track moves into the best weather conditions. Weather in the region is dominated by an extension of the large monsoon low over India and Pakistan. While low pressure systems are normally associated with cloud and rain, this particular low lies beneath an upper level high which suppresses the formation of cloud. A weak frontal system extends from northern Iran to the Mediterranean coast, separating moderate temperatures and moisture on the north side from the semi-arid airmasses to the south. Upper level winds tend to flow from the west in northern Turkey and from the east in more southerly parts along the track. The narrow coastal plain along the Black Sea coast of Turkey has a Mediterranean climate and represents the airmasses north of the front. This area has sufficient moisture to grow figs, olives, tea and tobacco. Most of the rain falls in winter, but steady northwest winds in the summer season bring occasional convective clouds with showers and thundershowers. The eclipse comes ashore at a remote part of the Turkish coastline near the town of Cide. To the east of the shadow path is Sinop, an ancient city of Greek and Byzantine origins. Its most famous native son was Diogenes the Cynic, who is reputed to have replied to Alexander the Great when asked what Alexander could do for him, "Yes, stand aside, you're blocking my light," Ð a perfect quotation (though not sentiment) to go with a solar eclipse [Ayliffe et al. 1994]. The scenic road to the center line winds closely along the coast, forced to the edge of the sea by a range of 2000 meter mountains which line the Black Sea coast. Cide, a few kilometers inland from the sea, has a 10 km long pebbly beach nearby which could provide a site to watch the eclipse. Travel time from Sinop to Cide is about two hours. West of the center line is the regional capital Zonguldak, slightly closer than Sinop, and with good transportation connections to Ankara. The steady onshore winds along the coast promote the development of convective cloudiness as they rise up the mountain slopes which line the sea, but cloud statistics for Zonguldak and Sinop promise weather at least as favorable as on the Bulgarian coast. Farther south, the track reaches Sivas on the eastern edge of the Anatolian Plateau. This city of magnificent Sel?uk monuments has a history extending from Hittite times to the formation of modern Turkey. The frequency of days with scattered cloud rises rapidly here as downslope winds from the surrounding mountains dry the air. Much of the meager cloudiness is due to occasional summer thundershowers, though the incidence of rainy days is dwindling rapidly. Nevertheless, some of these thunderstorms can bring violent weather with widespread cloudiness. As in eastern Europe, they are primarily an afternoon event, but because the eclipse is later in Turkey and the heating of the ground more pronounced, thunderstorms are more likely here than in Europe at eclipse time. Beyond Sivas the shadow bounces across the eastern limb of the Taurus Mountains, with gradually improving prospects for good eclipse weather. When the shadow path finally departs the Taurus Mountains it descends into the Tigris Valley and reaches Dyarbakir, a sprawling city with a large Kurdish population. The political turmoil of the area has converted Dyarbakir into a large military outpost, enhanced by the presence of a large NATO air base with shrieking jets and thumping helicopter rotors. Weather prospects are excellent (in spite of the anomalous "% of Possible Sunshine" in Table 38) as August is the hottest and driest month of the year. Statistics for the area show that only scattered clouds can be found at eclipse time on 24 to 28 days of the month, and nearly 30 days at the border with Syria. 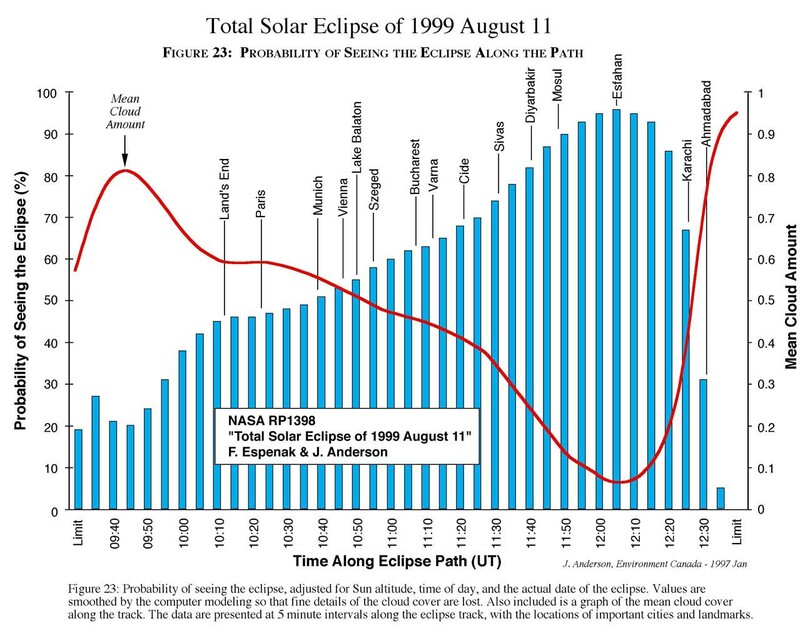 The viewing probability in Figure 23 rises above 80% as thunderstorms almost cease to be a threat, and the eclipse track moves into its most promising arena. Mountainous terrain intervenes again as the eclipse path moves across Kurdistan into Iraq. It is a volatile area and best left alone, in spite of the clear skies. Travelers here must contend with a region in turmoil and will have to have a special quest for adventure. Even better weather and a more stable political climate comes in Iran where the track leaves the Zagros Mountains and moves onto the desert plateau. This is an arid area with temperatures approaching 50° C. The low humidity makes the heat somewhat more bearable (as will the cooling with an eclipse), but by the time the track reaches the Pakistan border, sultry humidities from the Gulf of Oman promise less pleasant observing conditions. Skies are nearly cloudless over Iran for the most part, except for the occasional patches of scattered convective clouds and light showers. These are usually weak enough that they will succumb readily to the cooling which comes with the eclipse. Figure 23 shows that the apex of the eclipse viewing prospects is reached at Esfahan in southern Iran. Sites here have a 96% chance of seeing the Sun on August 11.